The transgender group of OutServe-Servicemembers Legal Defense Network announced Monday that it is cutting ties with the embattled organization, partnering with a new splinter group formed in the wake of a public controversy. A group of transgender veterans and members currently serving in the armed forces announced today that they are leaving the embattled LGBT military advocacy group OutServe-Servicemembers Legal Defense Network to join a new startup group focused more explicitly on securing open military service for transgender individuals. A press release today announced the formation of Service Members, Partners, Allies for Respect and Tolerance for All, or SPΛRT*A, a "group of LGBT people and allies who are currently serving or have served in the military, and our families," that is "especially committed to our Trans members… and to gaining full equality for them in the U.S. Armed Forces. SPART*A's Facebook page is currently active, while a website for the fledgling group is still under construction. SPΛRT*A lists among its strategic priorities supporting LGBT service members with opportunities for professional development and networking, ensuring equal opportunity protections for all LGBT service members, creating a fully inclusive culture within the Department of Defense that is respectful of all military members regardless of sexual orientation or gender identity, and providing connections to legal support for any service member who feels they've been a victim of anti-LGBT bias. SPΛRT*A's press release boasts members from military bases throughout the U.S., Afghanistan, Korea, Cuba, Guam, and Europe, with more expected to join soon. Members currently represent the Army, Navy, Air Force, Coast Guard, and Marines, according to the release. A separate statement also issued Monday announced that OutServe-SLDN's Military Transgender Group is formally cutting ties with the organization in the wake of widely-reported upheaval that saw OutServe-SLDN's newly appointed executive director, transgender Army veteran Allyson Robinson, asked to resign, followed by a slew of high-profile resignations in protest of Robinson's treatment and communication breakdowns within the organization. 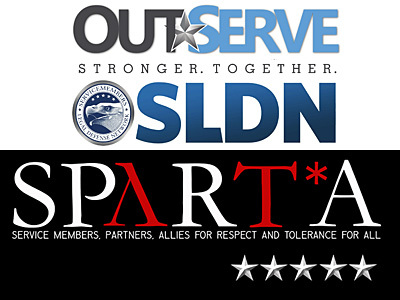 "Since the upheaval at OutServe-SLDN began on June 22, the transgender chapter of the organization has been working to determine where and how we can best fit within the movement," wrote Brynn Tannehill, the chapter spokeswoman for OutServe-SLDN's Military Transgender Group in a statement issued Monday. "This process has been painful, and strained personal and professional relationships that had previously been strong… The ultimate question we had to answer was where we need to be in order to most effectively move the issue of open service for transgender people forward. Unfortunately, it was the considered opinion of our members that OutServe-SLDN will not be able to represent our interests effectively for the foreseeable future." Tannehill's statement notes that the 120-member group deliberated, "without animus," about its options moving forward. "Given information we have available, we believe that SPΛRT*A has the combination of leadership and mission focus on transgender service needed to allow all of us to serve openly as equals," she writes. "We harbor no illusions that this will be a quick or easy process. However, our transgender group believes the people in SPΛRT*A have the will, stamina, and ability to see this through to the end." Notably, Tannehill, a Navy veteran, is listed among SPΛRT*A's leaders.